Yesterday I mentioned that I never told my children that there was a Santa. That also went for the tooth fairy, Easter bunny, and my parents creation the Birthday Bear. A bear that delivered birthday presents. I swear my parents really must have enjoyed making up fictional creatures to bring gifts. When my daughter was in Kindergarten she lost her first tooth. The kids in her class told her all about the tooth fairy and how that night she would put the tooth under her pillow and the next morning money would appear. As soon as she got home, she told me all about the tooth fairy. I explained the tooth fairy is like Santa Clause. He isn't real and that I am the tooth fairy for you. I said I would put money under her pillow. The next day she goes off to school, excited to tell everyone that her mom was the tooth fairy. When I went to school to pick her up the next day, the kids were so excited and asking me a million questions how do I know when they lost their teeth? How did I get into their house and back out? How did I make it to every ones (who have lost teeth) house in a night? What did I do with the teeth? I had no clue what to say. So I just laughed and said it was magic. I don't know how long these kids believed that I was the tooth fairy, but I did get several phone calls from parents wanting to know why their kids are insistent that I was the tooth fairy. Hahaha! Oh my goodness. That is too funny. 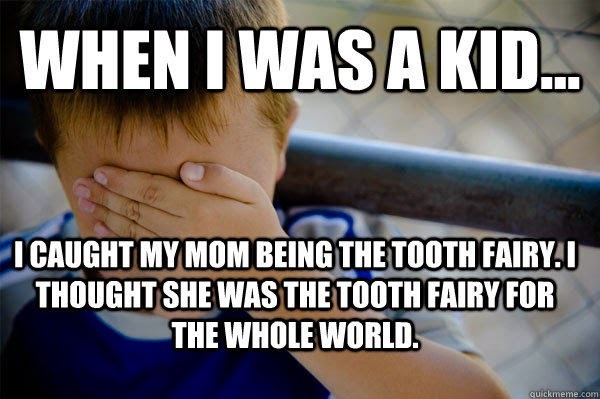 I don't remember how my mom handled stuff like that, since we always knew the tooth fairy and Santa weren't real. She might have had to explain to us not to tell other kids that, or maybe we just did and ruined it for everyone.